This one is from Mrs BrazilianGunner who is in fact from New Zealand. She is always editing my blogs and without a doubt must know a thing or two about metabolic efficiency and endurance sports by now. One of my goals for 2015 is to get her running a bit too. 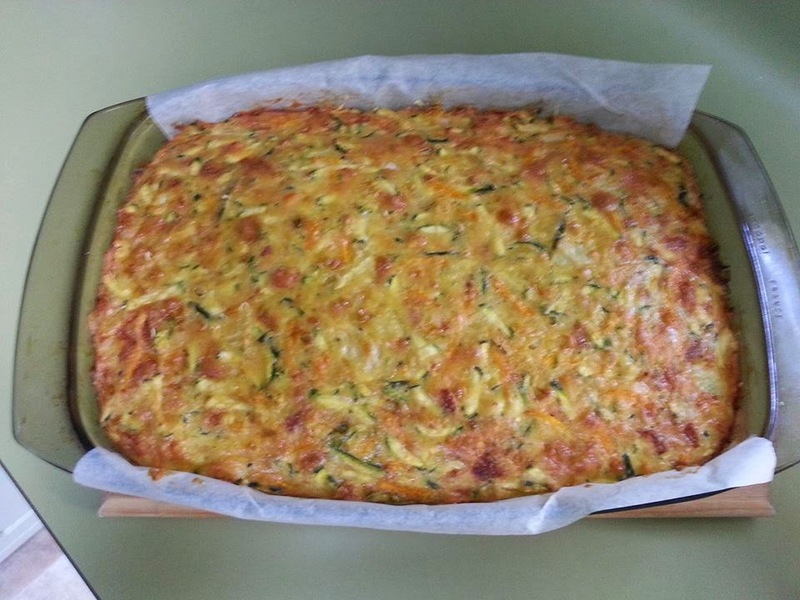 This savoury bake is super easy to make, great dinner for the kids or picnic, packed with great sources of fat and fibre and with the option of adding meat to the mixture to top up your protein intake. Salt and pepper / paprika/parsley (all optional)…. Add whatever you fancy! Parmesan, grated, for the topping. And if you fancy some MEAT too…. 1. Preheat oven to 180°C. Grease and line a 22cm base measurement cake pan. I used a pyrex roasting dish today! Whatever you have handy J I greased and lined it for easier removal. 2. Use your food processor (or your husband with the grater!) and blitz using the coarse grating attachment, the first 3 ingredients. 3. Combine courgette, carrot and onion in a bowl. Add eggs, oil and cheese, mustard and bacon, season and add the almond flour and baking powder and stir until well combined. 4. Pour mixture into cake pan/dish. Grate parmesan over the top if using. 5. Bake for 50 to 60 minutes or until a skewer inserted into the centre comes out clean. Great to eat hot or cold, it goes really well with a nice salad or some fresh vegetables. My 7-year old is going through a fussy eater phase at the moment and really enjoyed this bake.